A hotel staffed by robots may sound too futuristic to be true, but this is actually happening within Huis Ten Bosch theme park in Nagasaki. 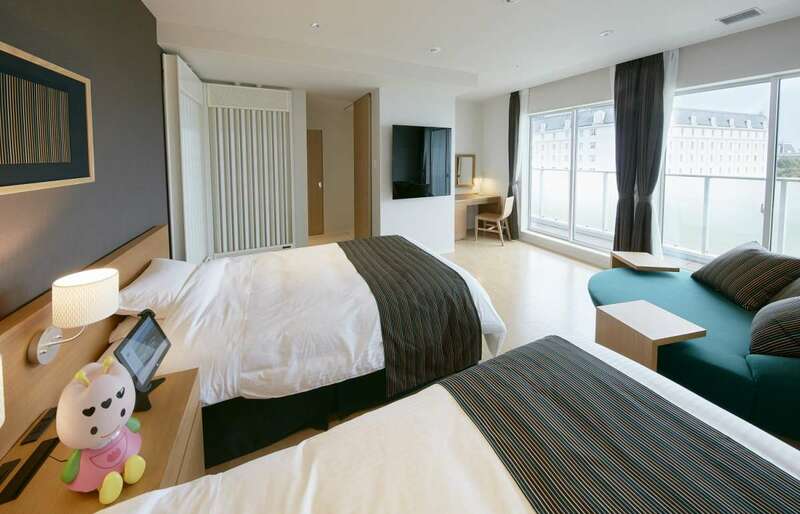 The world’s first hotel staffed almost entirely by robots opened in Japan last month. Too futuristic to be true? It is here now and functioning successfully. Located in the Dutch themed Huis Ten Bosch theme park in Nagasaki, the hotel whose name “Henn-na” translates as “strange hotel” is pushing the boundaries of robotics. For some the experience may prove extremely disconcerting. How far should we trust an android? Be reassured though; the hotel blurb says “please feel free to enjoy conversing with these warm and friendly robots as they efficiently go about their work”. And there are some humans around to ensure everything is running as it should. 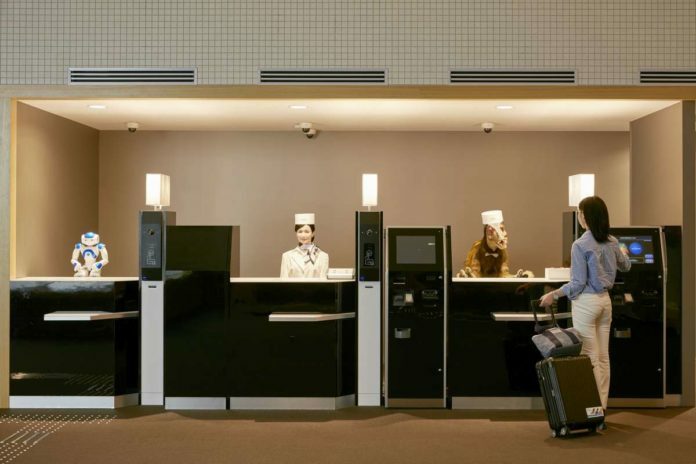 The reception desk in this 72-roomed hotel is staffed by a trio of robots, who blink, appear to breathe and politely guide you towards your check-in. Not all are humanoid. 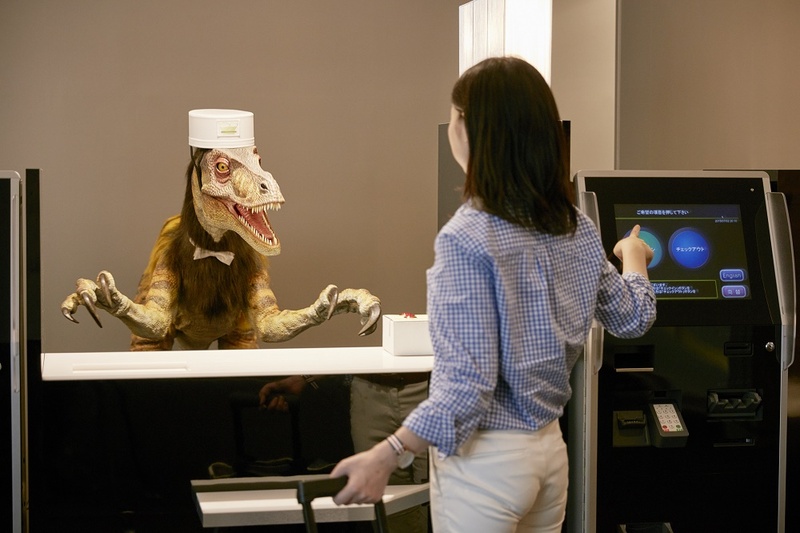 There’s also a robotic dinosaur to help check you in, but whatever their shape, they are polite, speak English, Japanese and Korean. Luggage is whisked away by an automated trolley and delivered it to your room. 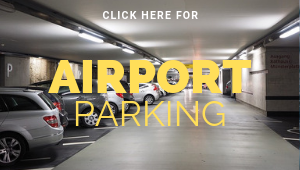 Doors are fitted with facial recognition technology so no key cards are needed and once in the room temperature is regulated according to your own body heat. 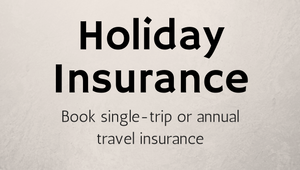 Each room comes with its own bedside, doll-like robot in pink and white with three hearts on its forehead. It acts as your in-room concierge and will tell you the weather forecast, the time and turn the lights on or off when you are tucked in bed. There is a tablet device (depending on room type) where you can watch tv and order room service (delivered by robots) delivered by robots who also clean the rooms. There’s no mini-bar or bathrobes but there are modern amenities such as hair drier and kettle and wifi is available throughout the hotel. The robots have been designed by a company called Kokoro who have been developing “actroids” for more than a decade. And the concept of a hotel served by robots is the brain-child of Hideo Sawads, president of Huis TenBosch. He said “In the future 90 per cent of the hotel’s services could be carried out by robots”. Does that mean they won’t need tipping? Rooms rates at the Henn-na Hotel start from around £40 (Y7,000) per night. Can robots really run our hotels?